Please remember when reporting a sighting please leave your name and phone number with the date and location of the sighting. The Sunday bird walk went to the Nanaimo River estuary in south Nanaimo. The morning was sunny and warm with a slight breeze off the Strait of Georgia. A MacGillivray’s Warbler was seen at the start of the walk. We spotted a Common Raven chasing a Northern Harrier over the tall Oak Trees across the river. There was a Greater Yellowlegs and a Lesser Yellowlegs feeding along the shoreline. Eight Great Blue Herons and a Bald Eagle were perched along the ocean shore. Several Barn Swallows, a Northern Rough-winged Swallow, and Violet-green Swallows were seen over head. A singing Savannah Sparrow was seen near the trail at the end of the walk. 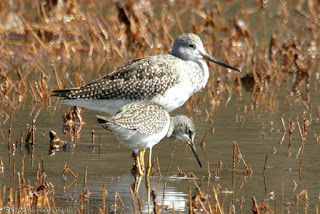 Lesser and Greater Yellowlegs: Ralph Hocken Photo. Seven Spotted Sandpipers were seen at, Sunset Beach at Neck Point Park in Nanaimo. The Sunday Birdwalk on August 06, 2017 will be going to Bowen Park in Nanaimo. 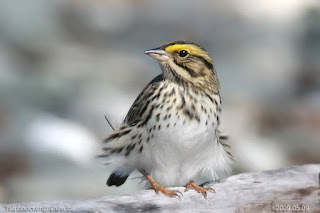 Meet at the Birdstore at 9:00 a.m. or at main parking lot near the Lawn Bowling Green at Bowen Park, off Bowen Road in Nanaimo at about 9:20 a.m.